100 BRAND NEW CARDS to add to Joking Hazard, the offensive card game from Cyanide & Happiness. These comic panels are dirtier and weirder than ever. Mix them in and take your game to new heights. High quality cards written by low quality people. DON’T buy this for children, and only buy it for the really cool elderly. You wanted more cards, and we made them! 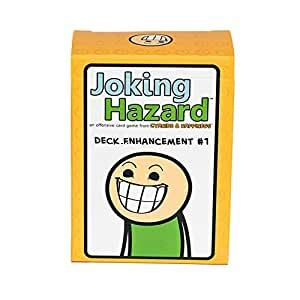 Our first deck enhancement adds 100 BRAND NEW CARDS to your Joking Hazard game. Simply mix them into your Joking Hazard deck, and enjoy.